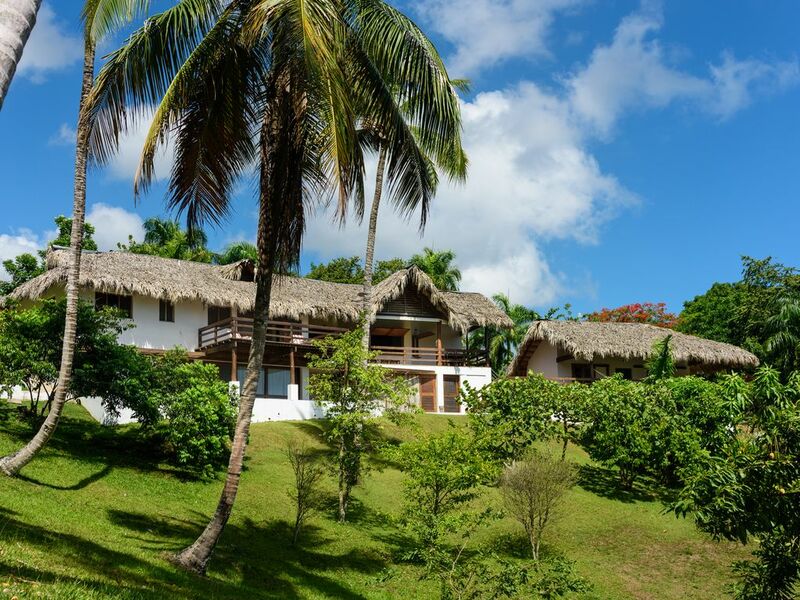 Situated at 15 minutes from Las Terrenas, near the wildest beaches of the region and the Limón waterfall, casa Bamboulita offers you rooms with sea view. A haven of peace in the middle of nature! You find yourself in the middle of a tropical garden overlooking a small valley. The birds accompany you with their songs and the leaves of the palms respond by sighing to the caresses of the breeze. Our horses, Pintica and Copito, quietly go about their business. Casa Bamboulita has 5 rooms. The master bedroom has a great view of the valley and the sea. It is equipped with a king size bed and a large private terrace. The large children's room is equipped with bunk beds as well as a queen size bed. The suite offers two bedrooms and a shower room. This space comfortably accommodates five people and a baby. Located in the annex of the house, the large room "Gecko" is independent and accomodates 2 people. Her name is reminiscent of the mosaics in her shower room made by our friend Beryl. Its large doors open onto the terrace, facing a majestic mango tree. Imagine ... You have your breakfast on your terrace. You eat fresh fruit from the garden. We have three dogs: Genaro, Lisa and Laya. They are well educated and quiet. Unless you want them, you will hardly notice them. Our garden is over two hectares and we will keep them in their enclosure during your stay. We stayed at Casa Bamboulita in April, 2019, and had an amazing time! We were greeted immediately upon our arrival, and everything was as beautiful as the pictures indicate. The house was very clean, and the views were stunning. It was so nice to cook in the kitchen, with all the windows open overlooking the property. The house is a short drive to Playa El Limon - and I HIGHLY recommend visiting this almost deserted, unspoiled beach. It is also a short drive to Las Terrenas, with a beautiful beach there as well. It is about a 10-15 minute drive to a bigger grocery store called Super Mercado Lindo. We found everything we needed there. We will definitely come back to visit! Thank you Nicolas for letting us enjoy your beautiful home! We had a great stay here, The house is just off the main road so easy to get to but is over a small hill so is quiet with nice views. The grounds are large and well tended. It made a good base for exploring Samana Peninsula. The house itself is gorgeous and the deck is incredible. We spent hours just relaxing in the hammocks or cooking in the ktichen with the shutters open to chat with people on the deck. The house has no air conditioning but it is built to catch the breeze and we had no problems. I would recommend having a car here and also be aware that the caretakers speak only Spanish. La casa cumplio con todas las expectativas. El dueño fue muy servicial en todo momento respondiendo prontamente todas nuestras preguntas. El personal que trabaja en la casa es muy amable y siempre dispuesto a colaborar. Si tuviera que dar una sugerencia diría que sería bueno un upgrade de los utensilios de la cocina. I had the privilege of staying at Casa Bamboulita with family and friends and would highly recommend other visits this amazing property. I had a great experience from the moment I booked. Within minute of confirming my reservation, the owner, Nicolas, sent me a personal email with direction on how to get to the property and offered to answer any questions I had. Nicolas went above and beyond to ensure we had an enjoyable experience. My family just couldn't believe how beautiful Casa Bamboulita was upon seeing it for the first time. The property is tucked away on top of a hill and offers some amazing views of the surrounding area. The furniture, beds, kitchen supplies and other amenities are in pristine conditions. Oh and there is a collection of movies and game to choose from if you are in the mood to stay home and relax with friends and family. The best part is that the property is within walking distance of local restaurants and is only a 15 minute drive to some of the most beautiful beaches in Las Terrenas.